What is a “tax coach”? You’ve probably never heard this term before. More than likely you are familiar with a “life coach” or a “business coach”. These people are experts who can help you improve your mindset, help you to recognize your potential, and push you to get past various challenges that are keeping you from personal and business success. A tax coach is similar to other types of coaches. 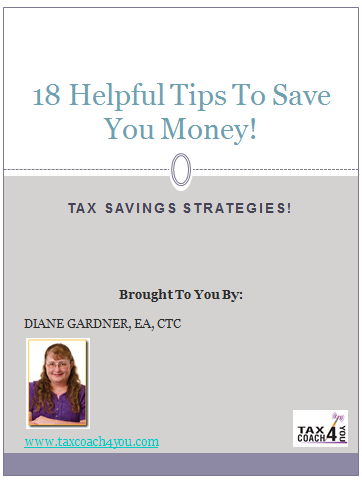 This expert will come along side you, look at your business and financial information, and then determine where you may be wasting money by over paying your taxes. Taxes are your biggest expense and it makes sense to focus your financial defense where you spend the most. You’re almost certainly not taking advantage of every tax break you can. Our tax code is thousands of pages long, with tens of thousands of pages of regulations. There are thousands more pages of IRS guidance, along with volumes of court cases interpreting all those laws, regulations, and guidance. The sad reality is, there’s probably no one alive taking advantage of every tax break they’re entitled to, simply because there are so many of them out there. And most tax advisors aren’t very proactive when it comes to saving their clients’ money. They put the “right” numbers in the “right” boxes on the “right forms,” and getting them filed by the “right” deadlines. But then they call it a day. They do a fine job recording the history you give them. But wouldn’t you prefer someone to help you write history? The good news is, you don’t have to feel that way. You just need a better plan. Owning your own business is the biggest tax shelter left in America. Now you just need to take advantage of what you already have! Diane is available for podcast interviews, radio show interviews, and in-person interviews. Five Simple Steps to Business Growth and Success – Implement these simple steps and watch your business grow! I will give you turn-key interview questions and an outline of my answers so you can quickly and easily dive into the call or in-person interview. I can quickly and easily adjust my topics to speak directly to your niche.